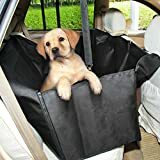 Dog Car Seat Cover Waterproof Heavy Duty Dog Hammock with Seat Belt and a Bag, Pet Car Seat Protector With Side Flaps, Scratch Proof Nonslip Padded Pet Seat Cover for Cars Trucks and SUVs. Clevamama 3 in 1 Travel Cover Rose. Clevamama 3 in 1 Travel Cover Lime. 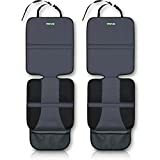 Water Resistant Set of 2 Front Car Seat Covers Black.